Flipping between al-Jazeera and al-Arabiya this morning before my conference, I saw non-stop coverage of the escalating Israeli war in Lebanon (not just Hizballah, it doesn't work that way). Al-Jazeera especially was in full crisis mode – complete with the tagline and theme music. Smoldering buildings, explosions, images of bloodied civilians – those visuals dominated the viewing experience. Nobody could miss the message encoded in the sequencing of one of the al-Jazeera news briefs: bloodshed and burning buildings in Lebanon; then Gaza; then clips of Bush and Rice; and then – as the final scene and the coup d’grace – the Security Council deliberations on the Qatari resolution condemning Israel's use of disproportionate force receiving 10 votes in support… followed by John Bolton raising his hand to veto. The narrative there is hard to miss. A reporter asked me a few minutes ago why Arabs are reacting so mutedly to the crisis. I didn’t necessarily agree with the premise of the question. Arab regimes are reacting in a very restrained fashion, but that doesn’t mean that Arab public opinion feels the same way. My sense is that most of the pro-American regimes just want this crisis to go away, and are hunkering down and trying to stay out of the way (kind of like the United States, frankly). King Abdullah of Jordan and Hosni Mubarak have both made high-profile remarks critical of the Shia (Abdullah’s “Shia Crescent” warning, Mubarak’s slur against Iraqi Shia). Neither they nor the Saudi King Abdullah has any love for Hizbollah, which for them is both a potential threat to their own allies in Lebanon and a constant risk of generating these kinds of crises. And Mubarak was recently humiliated by the collapse of his mediation of the Hamas situation, which he blamed (obliquely but clearly) on Iran. I’d say that the only thing which these regimes like less than Hizbollah these days is their own publics. It's all connected. We’ve been seeing most of these regimes cracking down, becoming more repressive over the last months. They simply have no interest in seeing large, angry crowds of citizens gathering to protest these days. In the past, pro-Palestinian or anti-Israeli protests were a convenient way for those regimes to redirect public anger and to let off steam. But these days it may cut too close to the bone: I mentioned the other day that one of the most dangerous trends (from the perspective of these regimes) is their contemptuous dismissal by mainstream Arab opinion: why, ask those critics, even waste our breath demanding that these regimes do anything when we know that they can’t and won’t. So the Arab media is covering it heavily, but regimes are largely focused on doing nothing and keeping their publics doing nothing. What do those publics think? Hard to say conclusively, of course. Outside of Lebanon (where Hizbollah is a local, not a regional, issue). The Arab public clearly does not share the ‘official’ Arab irritation with Hizbollah – Hassan Nasrallah is widely admired, and appears frequently on al-Jazeera and al-Arabiya, and surveys which have asked about Hezbollah have generally shown that it is considered a legitimate national resistance movement and is admired for its “victory” over Israel in 2000. But in general my sense is that Arabs across the political spectrum are torn between outrage, exhaustion, and fear. Outrage, for obvious reasons – the images of Israel’s actions in Gaza and Lebanon touch the deepest and most intense nerves in the collective Arab political psyche. Fear, because events don’t feel contained right now – it isn’t just Palestinians fighting Israelis far away, but something which Arabs fear might rapidly escalate. And finally, exhaustion: the combination of the incredibly turbulent events of the last few years – in Iraq, in Palestine, and in the rise and fall of hopes for domestic reforms – and the frustration of almost all public efforts to affect them can’t help but be debilitating. There’s always been a risk that the energy and mobilization driven by al-Jazeera and domestic reform movements could be a bubble, and that if their efforts came to naught that publics could either fall back into a resentful stupor (which is what the regimes, and the United States, probably want) or explode in more destructive ways. Don’t rule anything out. American public diplomacy has been virtually invisible on all this, at a time when it is more urgently needed than ever. I can understand this – you have to have a policy if you want to try to explain or defend it, and right now the Bush administration doesn’t seem to have any policy at all beyond supporting Israel and issuing calls for “restraint” which Israel promptly and publicly rejects. And what administration official wants to subject him or herself to tough Arab questioning on live TV right now? The idea that Palestinian-Israeli relations could be cordoned off from wider Middle East questions was always misguided. It’s now become actively destructive to all of our interests in the region. The only reason I’m not calling more loudly for Bush to get involved and take a leadership role in the conflict is the expectation that he would probably do the wrong thing. But at this point, doing nothing is, in fact, doing something. The Bush administration right now looks weak, confused, and vaguely pathetic... which is better than batshit crazy (like the folks who are demanding that America either smile on or even join in a war with Damascus and/or Tehran), but not nearly as good as exercising actual grown-up leadership at a time when the world could really, really use some. Thanks for the comment, ya Ustaz Abu-Aardvark. It's now personal to me, as I have a whole village full of relatives holed up a kilometer east of the Ain-el-Hilweh camp. My aunt has enough gasoline to power the generator for 5 to 10 days, if she only uses it to pump water. I have not been this frightened for South Lebanon since June 1982. I'm concerned about famine and rioting with all the services cut and a blockade on, not to mention the death already meted out and the deaths to come. It could get worse but this is very, very, very bad. Are you sure? Perhaps you should watch the Arab media less, and the American media more? I've been flipping through US news channels most the day, and it seems pretty clear what US policy is. That being: We support Israel. We oppose Hezbollah, Syria and Iran. The US is scared too. We're in freefall right now, to a similar (but lesser) extent as we were after 9/11. Iran has played it's proxy-war card, much sooner than expected. It's going to gte a lot worse than this. But America DOES have a policy prepared, because this was expected. Iran has been threatening to this in response to the nuclear showdown for over a year. Now they've done it. We'll see how US policy plays out. But the US *does* have a policy. 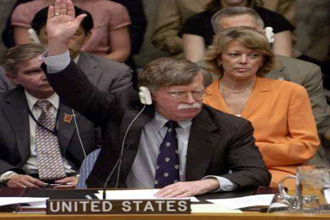 America will support--if not join--Israel against (Syria and Iran) if it comes to war. I don't think there is any uncertainty about this. I do not think any realistic person in America believes any other result is possible. If this continues to escalate, America will do one of three things. Either: a.) not openly assisting Israel's war on terror b.) openly endorsing Israel's war on terror or c.) joining Israel's war on terror. The Americans have clearly been itching to go after Iran and Syria for a while now (witness all the sabre-rattling comments about Iran that sound so similar to those made about Iraq in the months leading up to the invasion) but with American public opinion reluctant to get involved in another war and the Bushies' approval ratings being as low as they are (midterm elections in Congress, don't forget), they would rather do it by proxy it seems. Looks like their solution is to let Israel go ahead and start a regional war over a few POWs, rather than shaking them and telling them not to behave like trigger-happy idiots. Writing from a lebano centric viewpoint. Let us not forget that on the local scene, there is significant anger at Hizbullah for initiating a conflict that was bound to end with massive losses for lebanon. Initiating a conflict and dragging in the rest of lebanon without their consent, highlighting that Nasrallah is not loyal to lebanon. Furthermore the timing at the beginning of the peak tourist season makes this even more difficult to bear, and lastly the overt linkage to the palestinian issue by nasrallah raises all the bitter memories of all the other times lebanon was sacrificed at the altar of the palestinian cause or arab nationalism. Of course, the more Israel destroyes leb infrastructure the greater the anger in leb at them, but people are very aware that Hizbullah began this, and they will not forget this. I can safely say that outside the shiite community, support for Hizbullah and its actions are zero, and the notion that they are a "resistance" movement is very passe. Clearly in lebanon there is sympathy for GAza etc.. but lebanese do not want to bleed for gaza or anyone, in fact they are most resentful at seeing arab publics elsewhere always beeing beligerent etc.. and advocating conflict with israel when only the lebanese pay the price in blood (outside the palestinians of course). pardon for linking, O Greatest of the Aardvark, but here is a game theoretic take on the conflict. hummbumm - yes, that's why I excluded Lebanon from the general read on Arab public opinion, because it really is different there from everything I'm hearing and reading (for all the reasons you gave). Craig, Eric, SP - I'm less convinced than you, mainly because I don't think that there's any consensus in this administration right now. There are definitely groups who want to see those things, but there's also resistance. But really I don't see the administration as having a coherent foreign policy at all anymore - perhaps this crisis will force them into one/give one of the factions the opportunity it needs to seize control...but I don't think it's the sure thing like you all seem to. Of course, far be it from me to ignore the one sure-fire maxim governing all Middle East politics analysis: things can always get worse. Oh by the way, my relatives outside of Sidon are all fine, they've put in supplies of water and food. All roads in and out of all the villages have been bombed - they'll have to walk out but Dad says it's easy enough to cross ravines and such on foot. The Israelis bombed the farmers' market in downtown Sidon (note, a Sunni and minority Christian district, not sympathetic to Hizbullah, but it's possible some of the banana sellers are Shi'ites, so of course they all deserve death). Can't let the people congregate to buy food, that would support terrorism. My dad says my relatives are all yakking and playing cards and perfectly sanguine in the midst of the shelling. This is the spirit of Lebanon. Those of us who eschew violence insist on living our lives no matter what chaos swirls around us. The United States of America is a union of 50 countries which made the decision to become one country. In the "Arab World", as our beloved media have come to call it, there are many countries which have not formed a union in the same manner, or possibly at all. Yet the major news outlets in the Middle East portray the conflicts as one conflict not many separate conflicts. I can undertand an attack by a foreign military against one state in the USA being considered an attack on the whole country but I don't understand how Israel attacking Lebanon and the Palestinians is the same war as Bush's War in Iraq. 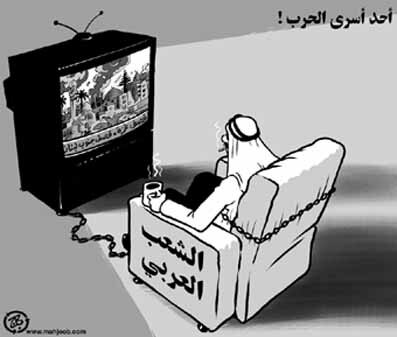 Where is the Arab unity really? I am not supportive of most, if any, military conflicts but I find many criticisms of how the West views the war not wholly understandable. All commentary appears to assume that Israel is merely responding to a Hezballa provocation. Then why is Israel destroying Lebanon? The Israelies know that the Lebanese government cannot control Hesballa, nor is the Lebanese army powerful enough to do so. So why is Israel attacking the Lebanese nation, including their armed forces? Could it be that Israel has a much wider agenda and has used the Hezballa attack as a pretext, just as the US used 9/11 as a pretext to invade Iraq? Do the Israelies expect to destroy Lebanon, then hand the ruins over to the Druse and Christian parties to rule over the Sunni and Shia? Are their plans for ethnic cleasning of southern Lebanon, turning that population into refugees? Is Lebanon to become a satelite state of Israel? The problem for the Israelies is that, although they have military superiority in weapons technology, its population is too small to fight an asymetric war against a resilient, trained opposition. Israel could defeat Syria, Lebanon and the Palestines militarily, but they would find it difficult, probably impossible, to occupy even Gaza City, much less Beirut or Damascus. That's where the US comes in. The Israelies hope to ride on Uncle Sam's shoulder towards empire. I just want to clarify two things that should be repeated across the world. According to the U.K Guardian's June 25, 2005 edition, Israel went into Gaza on June 24th and arrested two Palestinians. Other accounts say the arrested were a Palestinian doctor and his relative. This was the day before Gilad Shalit's capture. The earliest reports, including one in the Asia Times, the best paper on Earth, said that Israeli troops were on the Lebanese side of the border when they were captured. So, you see, it was Israel who provoked both captures, and this follows the game plan that the Israel firsters in the U.S., especially in the Pentagon have had for decades. The plan is codified in the 1996 paper "A Clean Break: A New Strategy for Securing the Realm" written by Douglas Feith, Richard Perle and David Wurmser amongst others for Benjamin Netanyahu. We are now following the Clean Break strategy because of the spineless whores in our Congress who will bend over and/or spread wide for the pro-Israel lobbies. Both parties. I respect streetwalkers more than our Congressional reps.
And our kids and kids all over the world will die in the months to come for Israel. I don't even give the world two years to survive because if Iran is attacked Pakistan will fall to the mullahs and then all hell will really break through. All because of that sh*tty little parasitic countries and its traitorous supporters not just in the U.S. but around the world. Sorry, I meant that Israel entered Gaza on June 24, 2006 not 2005. But it was the day before the capture of Gilad Shalit. And all the talking heads who natter on about Palestinian provacation neglect to mention that Israel made Gaza into the world's largest prison camps following the January election of Hamas. "Never again" is correct, that is unless you're a goy. Ustaz AA, you are right to say that this administration doesn't have a consensus or coherent, spelled-out policy concerning the Israel-Lebanon crisis, but the only person who seems to have spoken out for restraint is Secy Rice and she was roundly told to get lost by the Israelis, while her boss made statements at the G8 summit placing responsibility for the crisis on Hezbollah and essentially giving Israel carte blanche to do as it wished. Willy-nilly, that amounts to letting Israel do what the neocon hawks within the administration wanted - don't the actions and statements of the Bush administration in the last few days suggest that the "let Israel show Iran and Syria we mean business" contingent within the administration is winning out? What forces do you see working in the other direction? No, the 2 soliders kidnapped were in Israel. The eight IDF soldiers killed by Hizbollah had crossed into Southern Lebanon after the kidnapping. Since the "Six Day War" when the United States voted for Israel to release the expropriated territories back to the Palestinians, the USA has been flip flopping on policy during election cycles. Much like Florida's Cuban "Wet foot Dry foot" policies for the last 40 years to appease voters. The problem is, if we subsidize 25% of the United Nations, then shouldn't we uphold UN votes and policies? The US voted in 19666 for Resolution 242. The Jews in Israel, leaning on the thought of a 2000 year ago supremacy in Israel for 60 years, have been throwing Palestinians off their land. Even President Began's book told of the Urgan and Stern military slaughters of Arabs, "And we went through Haiffia screaming Deir Yasin Deir Yasin. It was like a knife through butter." Talking about the exodus of the Palstinians. Truth be known, we hid weapons during Salt II treaty counting in Israel, and had a military base. Maybe with more Chrisitan troops on the ground in Iraq, and the problem with Israel wanting to re-write agreements, and breach contracts, like the Oslo accords, the USA should think a new policy-oil. Truth be known, we are not drilling for oil in the Gulf of Mexico to be energy independent at home. The foreign countries are a little touchy while we invade countries for the spirit of democracy. ANd the Texas based friends of W Bush (like Exxon) are not doing well with foreign dictators, like Chavez. We want to be independent from foreign oil, as President Bush says? No, we are importing LNG-Arab natural gas. And according to USA newspapers, this will destabilize our own Western , Alaska, and Gulf of Mexico supplies. We will have a glut in 4-5years. If Chavez ceases to produce, and he is having internal labor squirmishes, since he fired half the country in the biggest labor union bust, even the new found oil and gas in Canada won't be available for US markets. The Iraq war is draining domestic supplies of gasoline, and European imports won't catch up. Florida has created LNG pipelines, while President Bush's Interior departments postponed major water quality EPA dockets and MMS dockets. The only independence the Administration seems to care about is W's home grown oil and gas companies. FYI, Peggy, I live in a medium-sized Texas town. Our local oil bigshot, who has enough status that he used to ride around on Air Force One with Reagan, also used to brag about being one of the ones who ran George W. out of the oil busines so that he had to take up baseball. Anybody who thinks GWB has a soft spot in his heart for the oil industry is full of... well, Marc doesn't seem to use that sort of word here, and I respect that. If that's the prism through which you see events, change it -- it's completely wrong. Remember that Enron made a pile of money under Clinton, but when Lay went to GWB for help he got told he was on his own. As for Hizb'Allah, GWB wants no part of it, but won't interfere in Israel's actions unless absolutely forced. Assume that Condi and Bolton speak for him, unless otherwise proven. As regards Lebanon, the Israelis are trying to prevent Hizb'Allah from moving around or getting resupply. That has, inevitably, a bad effect on the rest of Lebanon; the rest of us are sad that that's the case while seeing the necessity, and I suspect the Israelis, after half a century of unremitting hostility, just don't very much care any more. I don't think they deliberately intend to hurt the Lebanese, but there must be hundreds, even thousands, of Lebanese who have had an opportunity to shoot Nasrallah and didn't take it. Next time do better. Israel's goal is to make the Lebanese government pay an intolerable price for not disarming Hizbollah. Israel will do whatever it takes - destroying Lebanon's infrastructure, highways, roads, airport, buildings, bombing residential neighborhoods - to pressure Lebanon's government into disarming Hizbollah. This strategy, besides from being totally immoral and violating the Geneva Convention, will be unsuccessful as long as Hizbollah has the support of Lebanon's Shiite population. As Daniel Sobelman of Tel Aviv University's Jaffee Center for Strategic Studies has shown, Hezbollah has acted within a very restrained rules of conduct since Israel withdrew from Lebanon in 2000, its radical ideology notwithstanding. It's only since the United Nations started callling for Hizbollah's disarmament -which, to Hizbollah, is tantamount to its annhiliation- that Hizbollah stated looking for an excuse to escalate things with Israel, to send a message that it wouldn't go away. Hizbollah will only depart from the "rules of the game" to the extent that Israel enables it to. If Israel treats Hizbollah like a thorn in Israel's side, then that's all Hizbollah will be. On the other hand, the more that Israel treats Hizbollah like an existential threat, the more damage it allows Hizbollah to inflict on Israel.